In the heyday of the British Raj, eleven-year-old Anahita, from a noble but impov­erished family, forms a lifelong friendship with the headstrong Princess Indira, the privileged daughter of Indian royalty. As the princess’s official companion, Anahita accompanies her friend to England just before the outbreak of WorldWar I. There, she meets young Donald Astbury—reluctant heir to the magnifi­cent, remote Astbury Estate—and his scheming mother. Ninety years later, Rebecca Bradley, a young American film star, has the world at her feet. But when her turbulent relationship with her equally famous boyfriend takes an unexpected turn, she’s relieved that her latest role, playing a 1920s debutante, will take her away from the glare of publicity to a distant cor­ner of the English countryside. Shortly after filming begins at the now-crumbling Astbury Hall, Ari Malik, Anahita’s great-grandson, arrives unexpectedly, on a quest for his family’s past. What he and Rebecca discover begins to unravel the dark secrets that haunt the Astbury dynasty . . . 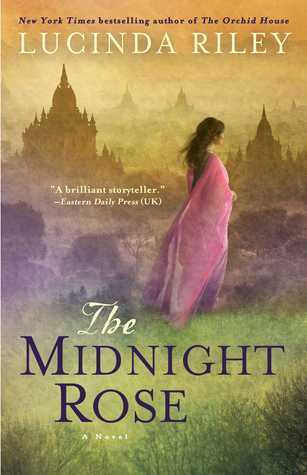 The Midnight Rose is the first book I have ever read by Lucinda Riley and I did enjoy it. It is a book that goes back into the past and also has a contemporary story that links to the past. How that past links to the present is gradually revealed. My favorite character and past was that of Anahita. I loved her life as a child in India, and her growing friendship with Indira. Usually I am not so fond of books set in India, usually told from a British viewpoint. Told from Anahita's viewpoint it was so much more rich and interesting, the customs of India as they came to life from her tale held my interest. Rebecca in the present day, an actress, part of series being shot at the Astbury estate made me think of the Downton Abbey series! There she meets Ari, the grandson of Anahita, he has come in response to the dying request of his grandmother. She has left behind the story of her time in England, and especially her relationship with Donald Astbury, the heir to the estate in her time. Rebecca and Ari work together to unravel the mystery of the past and in doing so hopefully bring peace to Anahita's spirit. Anahita's story is one of courage and care, yet one of sadness. A story that brings to light the evil happenings of the past and the oddness of the present. Towards the end of the book, I felt the whole story became a little melodramatic and over reaching. Although there were parts of the denouement that I did appreciate, especially the part about Anahita's long lost son.